I discovered Mysore masala dosa all over again. Yes I mean it when I say this. All of us siblings use to love the dosas my mom made at home with a creamy potato curry to fill the delicate dosas. And a plain coconut chutney and sambar that only she could make, other aunts we knew would make it differently. We were kids and never realised that dosas, sambars and chutneys can be of different types belonging to different states of the south India. We loved all the other dosa variants but the one mom made was always the best. We grew up on that dosa loving it absolutely. And then somehow I spoiled it when I started cooking it myself. In my zeal of experimentation I added what I liked and although the resulting dosa was always good, it was not the same. We siblings would often talk about the subtly flavoured dosa mom used to make long long ago. By the way my mom was never fond of cooking and she wriggled out of making dosas or anything for that matter, as soon as we grew up and carried on with our own lives, all of us siblings I mean. 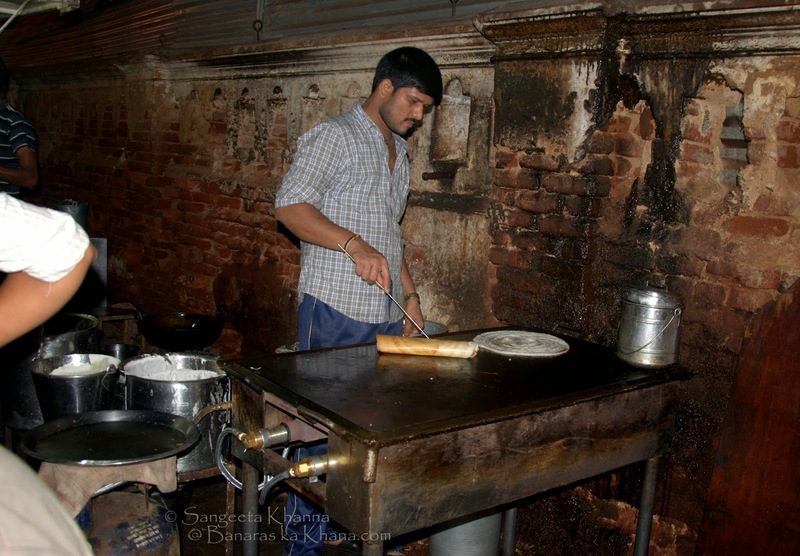 We would never find any home made dosa when we went back and that 'mummy ke haath ka dosa' memory became dormant. We always knew that mom had learned her dosa from some neighbor in Nainital when papa was posted there, which is my birth place too by the way. But there was never a question of where this neighbor belonged to. I discovered rather awkwardly in Mysore. 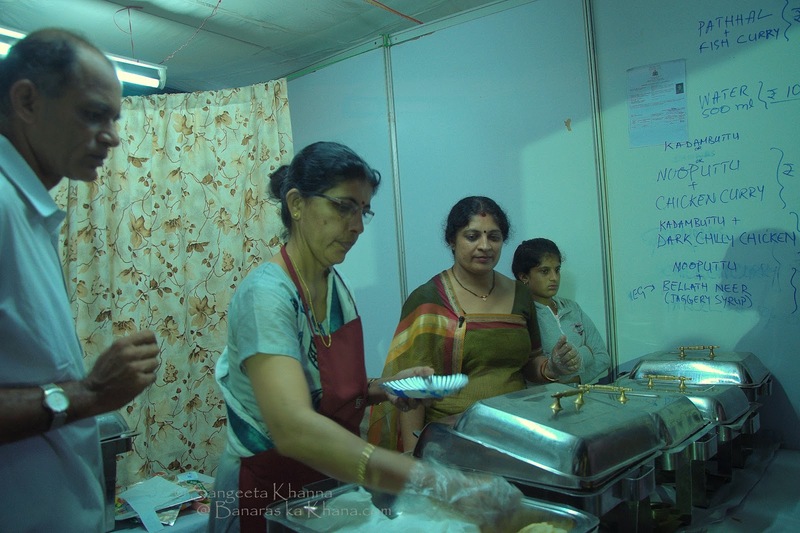 The first dosa at the CFTRI students mess we had reminded me of 'mummy ke haath ka dosa'. 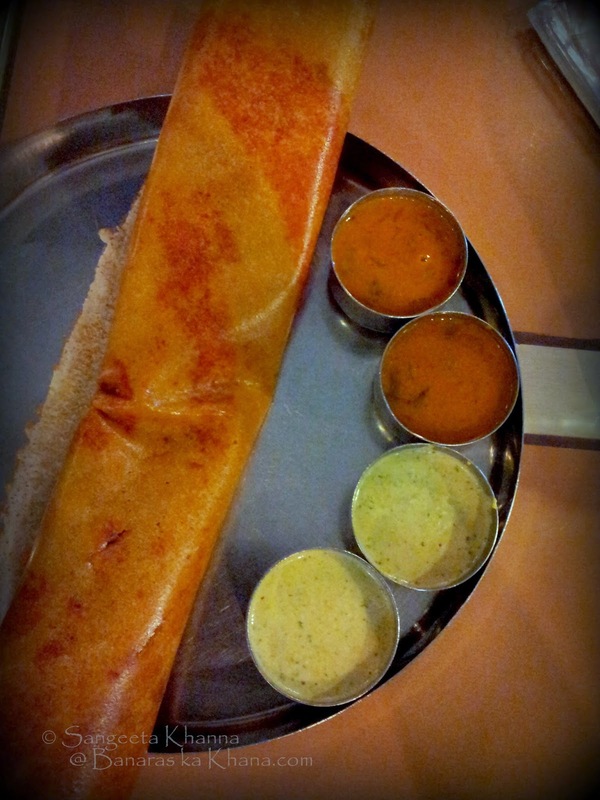 The identity of the Mysore masala dosa downed upon me in a moment of epiphany, dormant memories awakened. I grew up eating this sort of masala dosa and never knew this was the one. 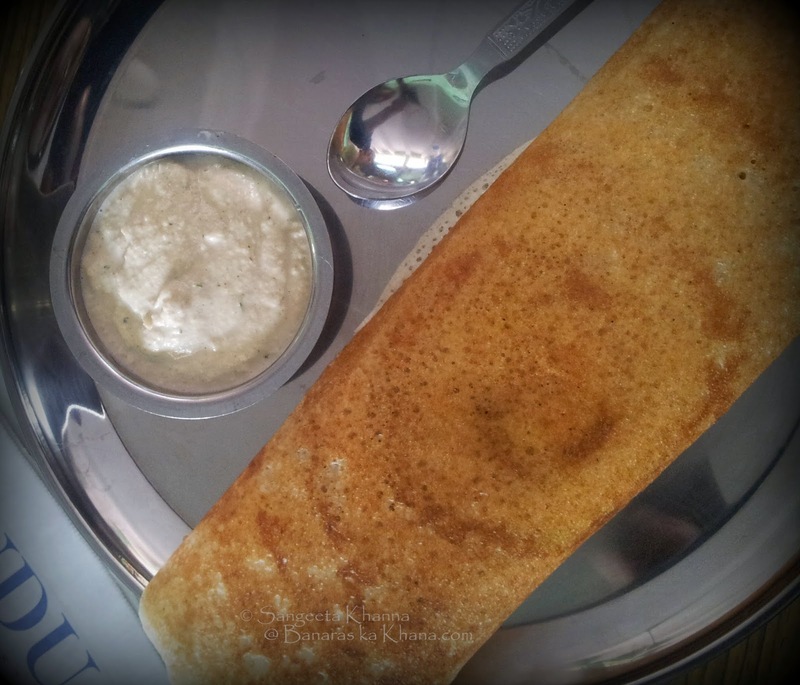 The one called Mysore masala dosa. To us it was just masala dosa, sans an identity attributed to a place. Later we discovered a few more stalwarts in the world of Mysore masala dosas. In Mysore of course. This used to a frequent breakfast masala dosa at the CFTRI students mess where we chose to have our daily breakfast. For other meals we used to explore the city. Well mostly it was just myself as Arvind used to be busy in his official work he was there for. I saw all the museums, lakes, markets and a few temples in the 2 weeks we were there. The best way to explore food in a city is to go around on foot or on public transport and see the street food if you can afford to. And I don't see any reason that can stop you from doing that, apart from a stomach infection if your immune system gets it as a shock. But I have never ever had a stomach problem with street food rather some five start food sometimes has caused a problem. Street vendors buy ingredients, cook and sell every single day and there is no recycling of ingredients, the food is served piping hot and things move quite fast. There is very little chance of contamination after the food being cooked as it is served immediately in most cases. And you should look for all such places where more people are eating to ensure good taste and the food is moving fast to ensure hygiene. You just have to take care of the water you drink and avoid all raw salads that's all. 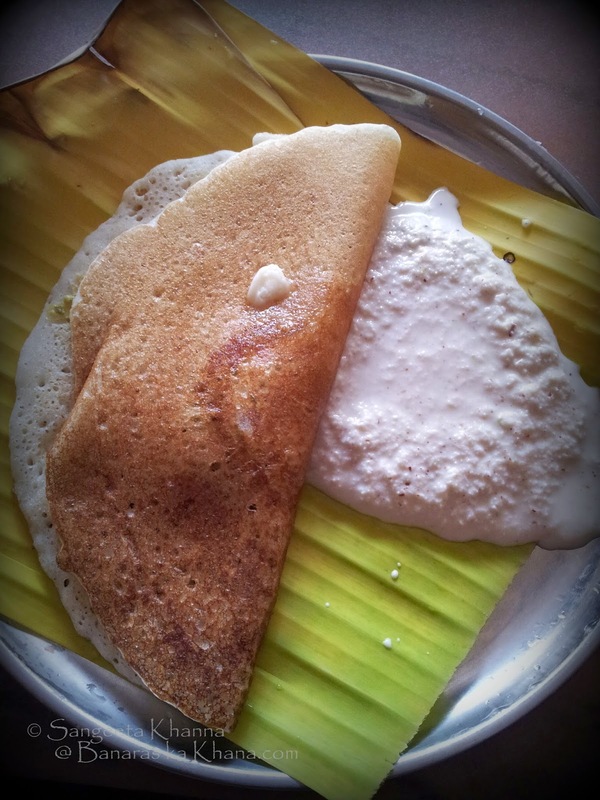 The first great dosa I had in Mysore was at a roadside eat street that my friend Shubha Shashikant had told me about. This street is behind the Marimallapa college and the autowalas (the tuktuk drivers) know it as 'chaat street behind Marimallapa college'. These street food vendors come by the road only by evening and you would see many bikes and scooters of students parked there and some portly middle aged men probably on the return from offices lined up up to have a bite and loads of gossip. We also spotted a few families too who used the seat of their motorbikes as a table and were having a good time. There were few cars that stopped by and people had food inside the car but this eat street looks like more popular with students and office goers as we found herds of them enjoying plates after plates of good food. 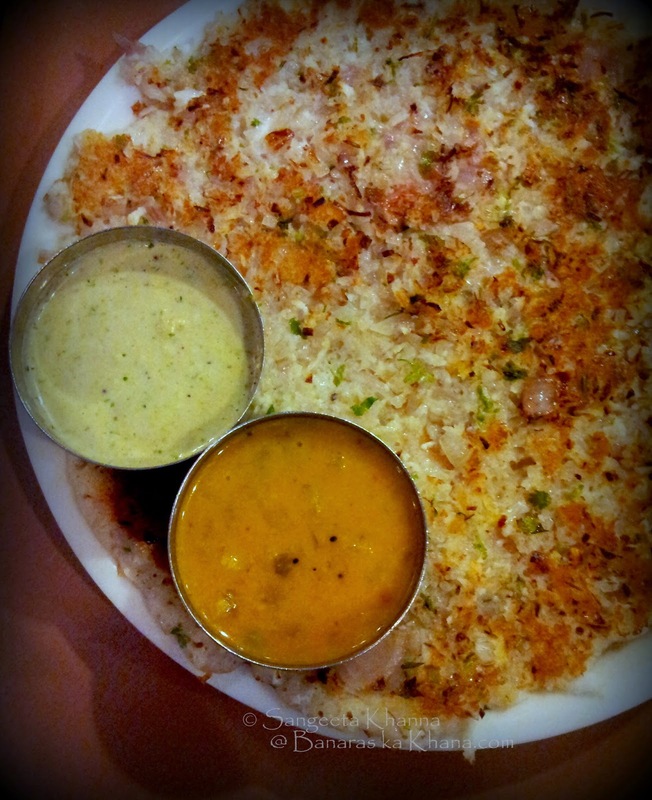 Our find of the day here was a Mysore masala dosa, very predictably you would say. I like the crisp but yet spongy dosa and the creamy mushy potatoes that they fill the dosa with. Simple clean honest flavours served in a humble way, each dosa costs 40 Rs. I remember everything on this street was either 40 or 30 Rs and the vendors had their own stalls of bottled water too. This dosa is smeared with a red chutney and then a dollop of creamy potato filling is slathered over it and the dosa is folded neatly. Served over a paper plate placed over a quarter piece of a newspaper. And then we tasted and liked the idli and sambar vada as well, the benefits of 2 people sharing plates of food, we could taste more but not all. We tasted puliogare too but did not like it much. But many people were lining up for puliogare and gobi manchurian. Now gobi manchurian was one thing I could not muster the courage to try. There are stalls of golgappa too but not worth, we ordered one plate and tasted one golgappa each, couldn't eat the next. Our driver had recommended another place called Guru Residency for a meal and we marched towards the place from CFTRI campus one day. This is a tall building of a hotel with the restaurant on the first floor. Quite crowded during Dassehra but this place is popular among the locals it seems. We ordered a masala dosa and an onion uttapam as these were the things we would like in a vegetarian restaurant in Mysore. While the dosa looked impressive with it's size, accompanied with 2 bowls of sambar and 2 bowls of coconut chutney, it was a good dosa but nothing great to write home about. We clciked only cell phone pictures as a big camera makes people really conscious and extremely curious at times in such places. But we loved the Onion uttapam we ordered. I wish we had more appetite and try a few more things on the menu. In fact we could not finish the huge dosa between the 2 of us. Onion uttapam we finished, it was well made and really tasty with finelu chopped onions spread as a uniform layer on the uttapam. But the lentil curry that came with the uttapam was not our taste. Coconut chutney was average. We had coffee that was good if not the best. 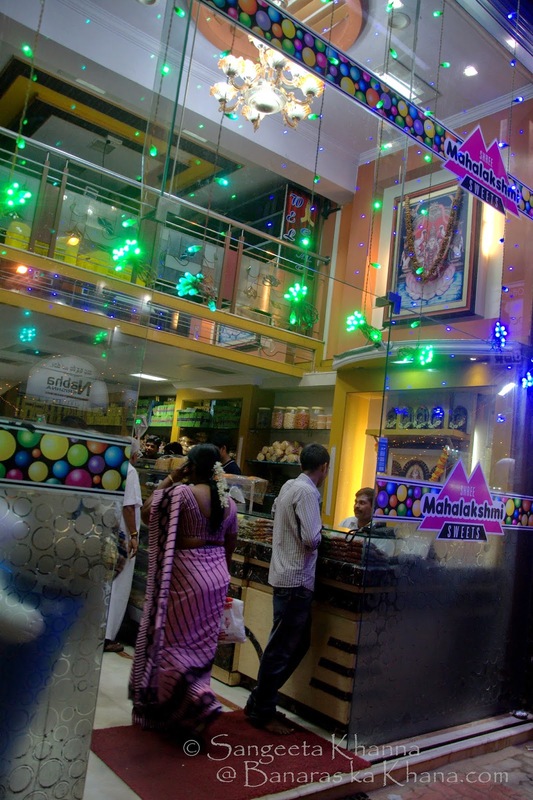 The good thing is, that we tasted another great dosa at Hotel Vinayaka Mylari at Nazarbad. I hear this small restaurant is 70 year old and has been serving just dosa and idli since then. Dosa has a nice filling of masala and coconut coated beans (or other vegetables) and a blob of white butter is served over it. 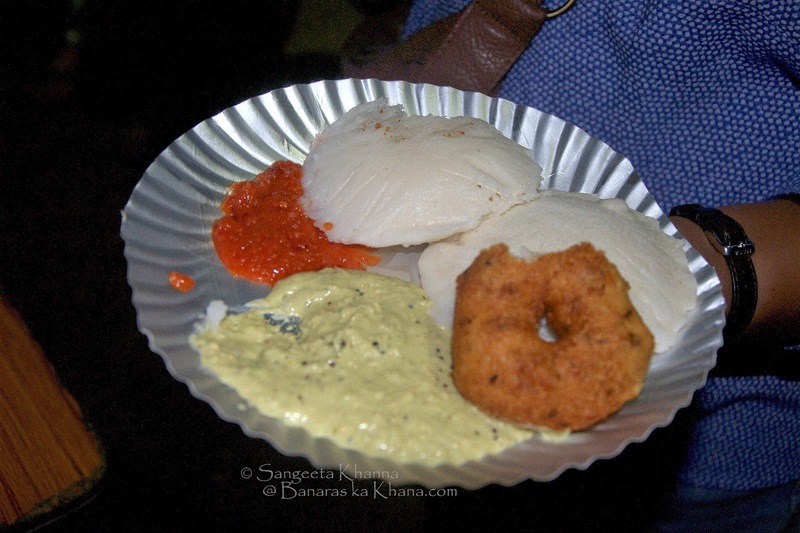 A plain white coconut chutney is served on the other side of the plate lined with banana leaf. We waited for our table for 30 minutes it was so crowded. The most soft and spongy dosa I have ever had and the best flavour of fermentation that one can get in a dosa. 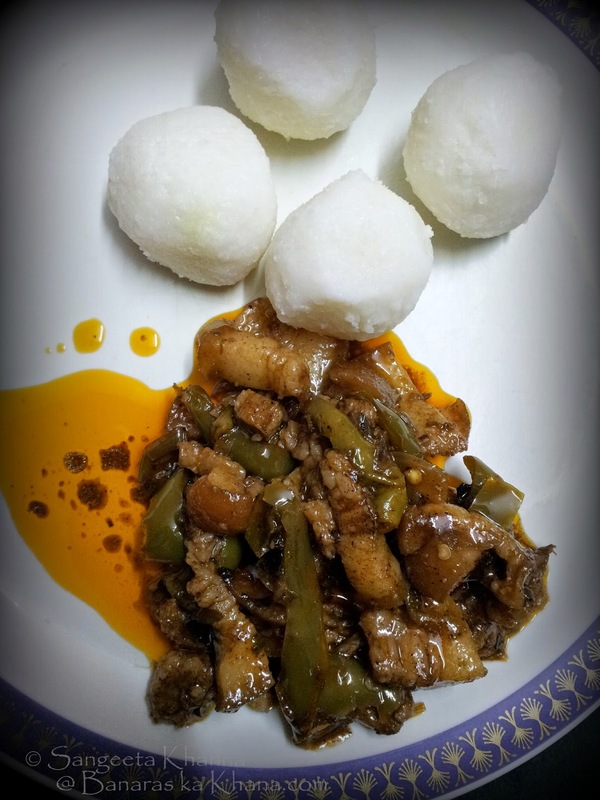 The idli was very soft, I had idli with butter for the first time. This is a must visit place in Mysore. They serve coffee too and the wait staff is both men and women, they keep bringing more food to your table just like old fashioned wedding feasts and a small slip is produced as you finish. For 4 dosas, 2 plates of idli and 2 coffees our total bill was 90 Rs. Only one picture was clicked before we dug into the dosa and then there was no looking back. We ate with our soul spread over the banana leaf and fingers smeared into a rustic pleasure. No time to think of clicking a picture. Another day we met Shubha and her family in market and she suggested we taste this authentic Mysorean mithai called Halbai. Halbai is apparently available only at Hotel Dasaprakash so we walked to the Hotel to taste this. 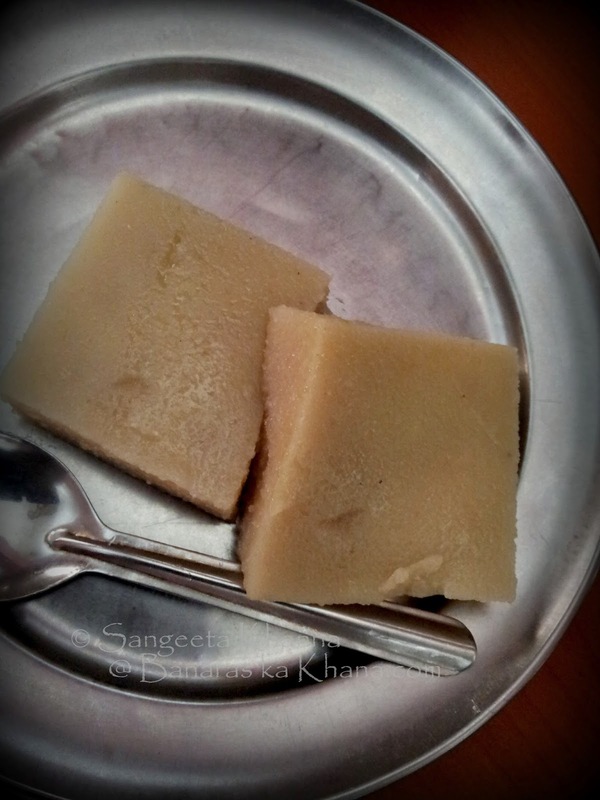 This mithai called Halbai is actually a pudding that is cut into squares. The taste is mild sweet with hints of coconut. Soaked rice and coconut is ground and strained and then cooked till thick along with ghee and sugar. The cooked mixture sets into a jelly like layer which is cut into squared and served per piece as most Indian mithais. We liked the subtle taste in this lesser known mithai from Mysore. 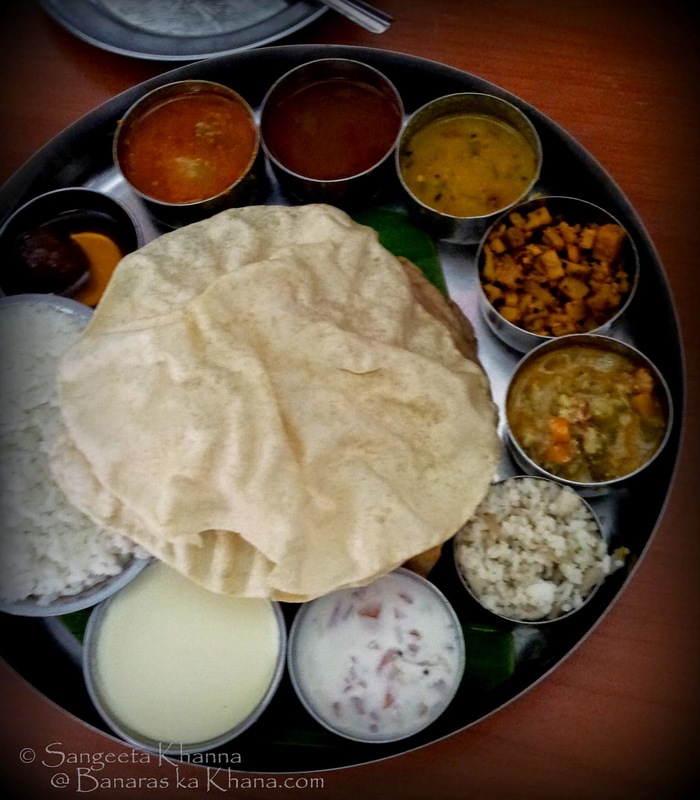 Later we tried the Mysore thali from Hotel Dasaprakash but it was not impressive. Although I liked the Ole (sooran) stir fry with curry leaves and coconut etc and another curry with coconut milk. Other elements in the thali were average. Apart from these we were lucky to witness a food festival for a week called Ahar Mela that was very close to CFTRI campus where we were staying. We found a Coorgi stall and had our fill of Pandi curry, chilly pork, black chilly chicken, Coorgi chicken curry and fish curry with Nooputtu, Kadambuttu and Sanas.This food was so good we found ourselves at this stall every other day at dinner time. And we got the food packed for our lunch most of the times. We made the best use of this opportunity you see. Now a thing about the Mysore paak. The sweet (mithai) that Mysore is so famous for. We tried the regular Mysore paak and Kaju Mysore paak from Mahalaxmi Sweets on KR Circle road and found it good. I actually loved the kaju Mysore paak despite being cloyingly sweet. The plain Mysore paak from Mahalaxmi is also good, slightly brown in the middle and nicely caramelized flavours. 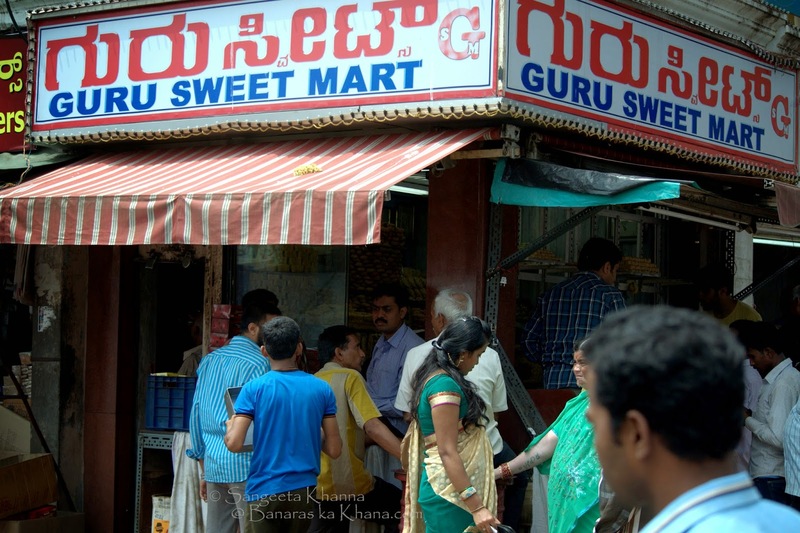 We had heard great things about the The Guru's Mysore paak as these were the people who are supposedly the inventors of this famous mithai but the Mysore paak was so unbelievably sweet and ghee laden that there was no flavour of caramelized besan that it should have. You get a sandy texture of sugar in this one that spoils it for me. 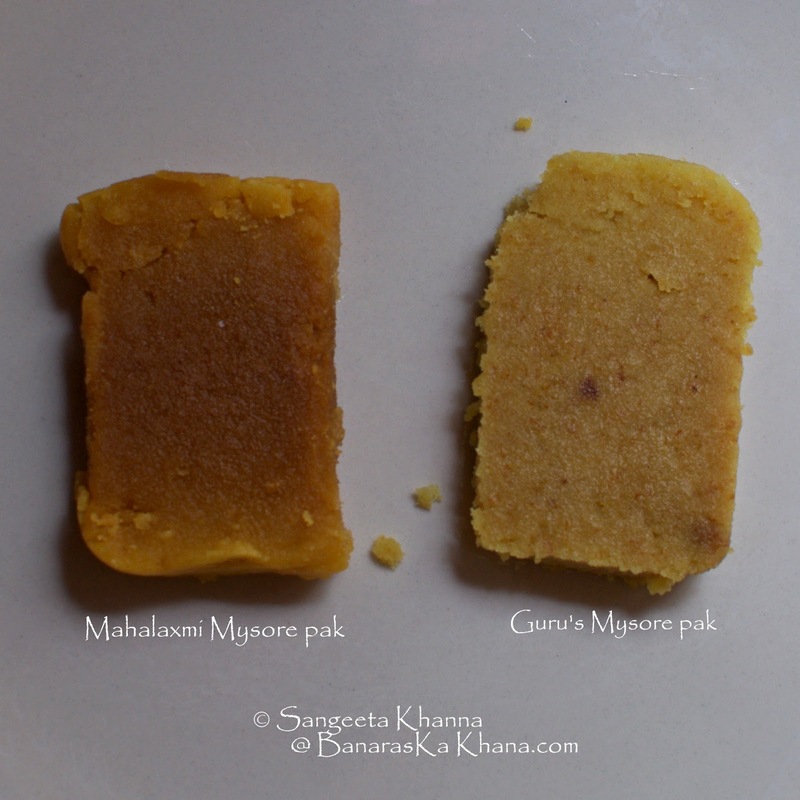 And about 2 weeks later when I tasted both these Mysore paak from different shops, I could taste bad quality ghee used in the Mysore pak from Guru Sweet Mart. The brown one from Mahalaxmi sweets was the same in taste, taste of good quality ghee cannot be mistaken. Mysore is a pace to be discovered slowly I feel. One cannot feel the pulse of the city in a hurry. One can go see all the museums the city boasts of and lakes and nature parks maintained really well but to eat I would always suggest to find some or the other street vendor or one of those small eateries we see along the roadsides. You never get the real taste of a place in five star hotels, it is the street food that brings you closer to the place. Sangeeta it is uncanny how similar our view points are. I also try to live as local a life as possible when i travel. Only a frugal lifestyle permits to discover a place and explore its myriad facets far away from the sanitised environment of five star hotels. I dislike even modern apartment complexes. They look the same all over the country and are usually far from all the interesting places. And i love to eat from crowded places. It is fresh, tasty,filling,hot,hygienic and value for money. Very often I take counsel from kind looking locals and till date have never been disappointed. This works during shopping too. Apart from water I also avoid ice and dahi. Your guide is so enticing that I may stop over at Mysore while going to Kerala. I wish you would do a post on Benaras as it is a overnight journey from my place and I really want to spend a few days there. Thank you Anoop :-) So glad to see you here on my blog. Yes Mysore is a small 'city', I liked the cleanliness compared to most big cities. Halbai is a sweet my neighbour from Mangalore used to make.She was excellent at it. I have visited Mysore .I will have to visit once more to eat at lal the places you have stated.Thank you very much for such a wonderful post on the Mysore food.It is my native state ! Thank you Vasudha. Please tell what all you liked in Mysore.